Perhaps one of the most common forms of turbulence we experience is called thermal turbulence. This is the turbulence that we feel during the midday when we're flying near the surface during late spring, summer and early fall and is usually not protected by AIRMET Tango. The heating of the day causes convective thermals to rise, and we fly into these parcels of air which causes us to bump around, right? Well, not exactly. 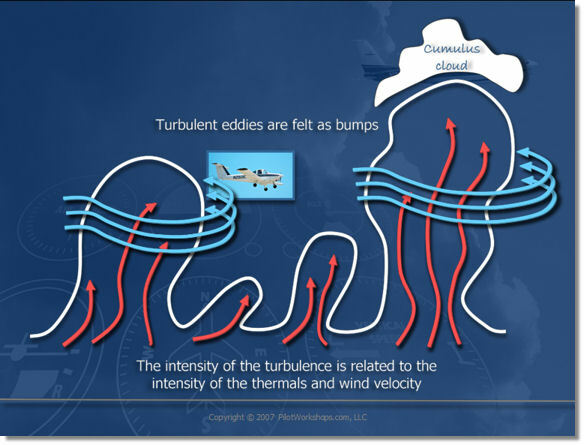 The turbulence is not typically caused by the rising thermals alone. It is the interaction between the thermals and the prevailing winds aloft that really make the bumps. These thermals act as obstructions to the normal air flow similar to mountainous terrain. The prevailing wind must deviate around the convective thermals resulting in turbulent eddies. These turbulent eddies are then carried downwind some distance before dissipating. The turbulent eddies are what we feel as bumps. Therefore, the intensity of the turbulence is related to the intensity of the thermals and the wind velocity. Light prevailing winds generally result in light thermal turbulence. Stronger prevailing winds mean that you should tighten your seat belt.